Mahmoudi, R., Amini, K., Hosseinirad, H., Valizadeh, S., Kabudari, A., Aali, E. (2017). Phytochemistry and insecticidal effect of different parts of Melissa officinalis on Tetranychus urticae. 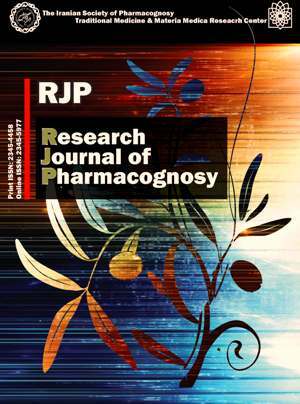 Research Journal of Pharmacognosy, 4(4), 49-56. R. Mahmoudi; K. Amini; H. Hosseinirad; S. Valizadeh; A. Kabudari; E. Aali. "Phytochemistry and insecticidal effect of different parts of Melissa officinalis on Tetranychus urticae". Research Journal of Pharmacognosy, 4, 4, 2017, 49-56. Mahmoudi, R., Amini, K., Hosseinirad, H., Valizadeh, S., Kabudari, A., Aali, E. (2017). 'Phytochemistry and insecticidal effect of different parts of Melissa officinalis on Tetranychus urticae', Research Journal of Pharmacognosy, 4(4), pp. 49-56. Mahmoudi, R., Amini, K., Hosseinirad, H., Valizadeh, S., Kabudari, A., Aali, E. Phytochemistry and insecticidal effect of different parts of Melissa officinalis on Tetranychus urticae. Research Journal of Pharmacognosy, 2017; 4(4): 49-56. 1Medical Microbiology Research Center, Qazvin University of Medical Sciences, Qazvin, Iran. 2Department of Microbiology, Islamic Azad University, Saveh Branch, Saveh, Iran. 3Deprtment of Cell Biology and Anatomical Science, Faculty of Medicine, Shahid Beheshti University of Medical Sciences, Tehran, Iran. 4Department of Food Hygiene and Quality Control, Faculty of Veterinary Medicine, Urmia University, Urmia, Iran. 5Deprtment of Food Hygiene and Aquatics, Faculty of Veterinary Medicine, University of Tabriz, Tabriz, Iran. 6Department of Pharmacology, School of Medicine, Qazvin University of Medical Sciences, Qazvin, Iran. Background and objectives: In recent years, biological control of parasites by essential oils (EOs) derived from plants is one of the alternatives to synthetic pesticides.Melissa officinalis from Lamiaceae family is distributed in many parts of Iran. It is known as an excellent source of antioxidants, antibacterial, antiviral and antifungal constituents. The present study investigated the insecticide properties of M. officinalis against Tetranychus urticae tick. Methods: The EO of different parts of plant was extracted and analyzed by gas chromatography and mass spectrometry (GC/MS). The ticks were placed on the filter paper in the bottom of a petri dish (9 mm), and contact toxicity assay was then performed by contacting the extract with the ticks. Results: The EO of leaves showed the most potent insecticidal effect while the stem EO demonstrated the weakest effect. The lowest concentration of EO from the leaves showed more considerable insecticide activity compared to the highest concentration of stem and flower EOs. Conclusion: Melissa officinalis is an effective insecticide with potent effect against T. urticae and it could be suggested as a natural pesticide against T. urticae. Yosofi M, Hojjati MR, Moshtaghi E. The effect of hydro-alcoholic extract of Melissa officinalis on learning and spatial memory in Balb/c mice. J Shahrekord Univ Med Sci. 2011; 13(4): 51-59. Bahtyarca Baghdat R, Cosge B. The EO of lemon balm Melissa officinalis L. its components and using fields. J Fac Agric Hokkaido Univ. 2006; 21(1): 116-121. Miladi Gorgi H, Vafaee A, RashidiPoor A. The role of opioid receptors on anxiolytic effects of the aqueous extract of Melissa officinalis in mice. Razi J Med Sci. 2005; 12(47): 145-153. Vogl S, Picker P, Mihaly-Bison J. Ethnopharmacological in vitro studies on Austria's folk medicine-an unexplored lore in vitro anti-inflammatory activities of 71 Austrian traditional herbal drugs. J Ethnopharmacol. 2013; 149(3): 750-771. Zeraatpishe A, Oryan S, Bagheri MH.Effects of Melissa officinalis L. on oxidative status and DNA damage in subjects exposed to long-term low-dose ionizing radiation. Toxicol Ind Health. 2011; 27(3): 205-212. Kim JK, Kang CS, Lee JK. Evaluation of repellency effect of two natural aroma mosquito repellent compounds, citronella and citronellal. Entomol Res. 2005; 35(2): 117-120. Kennedy DO, Little W, Scholey AB.Attenuation of laboratory-induced stress in humans after acute administration of Melissa officinalis (lemon balm). Psychosom Med. 2004; 66(4): 607-613. Kennedy DO, Wake G, Savelev S. Modulation of mood and cognitive performance following acute administration of single doses of Melissa officinalis (lemon balm) with human CNS nicotinic and muscarinic receptor-bindin­g properties. Neuropsychopharmacology. 2003; 28(10): 1871-1881. Nascimento GF, Paulo C, Silva L. Antibacterial activity of plant extracts and phytochemicals on antibiotic-resistant bacteria. Braz J Microbiol. 2000; 31(4): 247-256. Dastmalchi K, Damien Dorman H, Oinonen P, Darwis Y.Chemical composition and in vitro antioxidative activity of a lemon balm (Melissa officinalis L.) extract. Food Sci Technol. 2012; 41(3): 391-400. Auf'mkolk M, Ingbar JC, Kubota K.Extracts and auto-oxidized constituents of certain plants inhibit the receptor-binding and the biological activity of Graves' immunoglobulins.Int J Endocrinol. 1985; 116(5): 1687-1693. Meftahizade H, Moradkhani H, Naseri B, Lotfi M, Naseri A. Improved in vitro culture and micropropagation of different Melissa officinalis L. genotypes. J Med Plant Res. 2010; 4(3): 240-246. Carnat AP, Carnat A, Fraisse D. The aromatic and polyphenolic composition of lemon balm (Melissa officinalis L. subsp. officinalis) tea. Pharm Acta Helvetiae. 1998; 72(5): 301-305. Morelli I. Constituents and use of Melissa officinalis. Chem Pharm Bull. 1997; 116(46): 334-340. Hoogstraal H, Valdez R. Ticks (Ixodoidea) from wild sheep and goats in Iran and medical and veterinary implications. Fieldiana Zool. 1980; 6(12): 1-16. Telmadarhe Z, Vatandoost H, Rafinejad J, Mohebali M, Tavakoli M, Abdi Goodarzi M, Faghihi F, Abolhasani M, Zarei Z, Jedari M, Mohtarami F, Selgi AA, Salari Lak S, Entezare Mahd R. Prevalance of argasidea and ixodidea ticks and determination of their sensitivity to cypermethrin in Meshginshahr. J Ardabil Univ Med Sci. 2009; 9(2): 127-133. Ostfeld RS, Price A, Hornbostel VL, Benjamin MA, Keesing F. Controlling ticks and tick-borne zoonoses with biological and chemical agents. Bio Sci. 2006; 56(5): 383-394. Onofre SB, Miniuk CM, de Barros NM, Azevedo JL. Pathogenicity of four strains of entomopathogenic fungi against the bovine tick Boophilus microplus. Am J Vet Res. 2001; 62(9): 1478-1480. Hariri moghadam F, Moharramipour S, Sefidkon F. Repellent activity and persistence of EO from Eucalyptus salmonophloia F. Muell and Eucalyptus kingsmillii (Mauden)Maiden & Blakely on two spotted spider mite, Tetranychus urticae, Koch. Iran J Med Aromatic Plant. 2011; 3(42): 375-383. Mirzaei M, Dayani O, Molaei Javaran T. Comparison of the effect of biological formulations containing Metarhizium anisopliae on Hyalomma ticks. Shahrekord Univ Med Sci. 2016; 17(6): 73-82. Kaaya GP, Samish M, Hedimbi M, Gindin G, Glazer I. Control of tick populations by spraying Metarhizium anisopliae conidia on cattle under field conditions. Exp Appl Acarol. 2011; 55(3): 273-281. Perinotto WM, Angelo IC, Golo PS, Quinelato S, Camargo MG, Sa FA, Bittencourt VREP. Susceptibility of different populations of ticks to entomopathogenic fungi. Exp Parasitol. 2012; 130(3): 257-260. Ren Q, Sun M, Guan G, Liu Z, Chen Z, Liu A. Li Y, Ma M, Yang J, Niu Q, Liu J, Han X, Yin H, Luo J. Susceptibility of the tick Haemaphysalis qinghaiensis to isolates of the fungus Metarhizium anisopliae in China. Exp Appl Acarol. 2014; 64(2): 253-258. Mahmoudi R, Nosratpour S. Teucrium polium L. essential oil: Phytochemiacl component and antioxidant properties. Int Food Res J. 2013; 20(4): 1697-1701. Tapondjoy LA, Adelr C, Fontem DA. Bioactivities of cymol and EOs of Cupressus sempervirens and Eucalyptus saligna against Sitophilus zeamais Motschulsky and Tribolium confusum du Val. J Stored Prod Res. 2005; 41(2): 91-102. Pino JA, Rosado A, Fuentes V. Composition of the EO of Melissa officinalis L. from Cuba. J Essential oil Res.1999; 11(3): 363-364. Meftahizade H, Sargsyan E, Moradkhani H. Investigation of antioxidant capacity of Melissa officinalis L. EOs. J Med Plant Res. 2010; 4(14): 1391-1395. Mahmodi R, Amini K, Asadi Dashbolagh J, Farhoodi A. Antioxidant and antibacterial properties of Melissa officinalis EO. J Qazvin Univ Med Sci. 2016; 20(2): 49-57. Naghdi Badi H, Yazdani D, Mohammad Ali S. Effects of spacing and harvesting time on herbage yield and quality/quantity of oil in thyme, Thymus vulgaris L. Ind Crop Prod. 2004; 19(3): 231-236. Michel BE, Kaufmann MR. The osmotic potential of polyethylene. Plant Physiol. 2006; 51(5): 914-916. Ghoulam C, Fares K. Effect of salinity on seed germination and early seedling growth of sugar beet (Beta vulgaris L.). Seed Sci Technol. 2001; 29(2): 357-364. Shams Ardekani MR, Amanzadeh Y, Jahanshir F, Jamshidi AH. Pharmacognosical & plant tissue culture studies of Melissa officinalis L. J Med Plants. 2004; 13(4): 1-10. Gkinis G, Tzakou O, Iliopoulou D, Roussis V. Chemical composition and biological activity of Nepeta parnassica oils and isolated nepetalactones. Z Naturforsch. 2003; 58(9-10): 681-686. Hassanali A, Hoglund S, Pettersson J. Repellent activity of catmint, Nepeta cataria, and iridoid nepetalactone isomers against Afro-tropical mosquitoes, ixodid ticks and red poultry mites. Phytochemistry. 2010; 34(2): 616-624. Zhu JJ, Zeng XP, Berkebile D. Efficacy and safety of catnip (Nepeta cataria) as a novel filth fly repellent. Med Vet Entomol. 2009; 23(3): 209-216. Birkett Michael A, Toby JA, John A. Repellent activity of Nepeta grandiflora and Nepeta clarkei (Lamiaceae) against the cereal aphid, Sitobion avenae (Homoptera: Aphididae). Phytochem Lett. 2010; 3(3): 139-142. Norouzi M, Soleimani T, Pasha Zanousi M. Essential oil component in leaf and flower of lemon balm (Melissa officinalis L.). Res Pharm Sci. 2012; 7(5): 749.